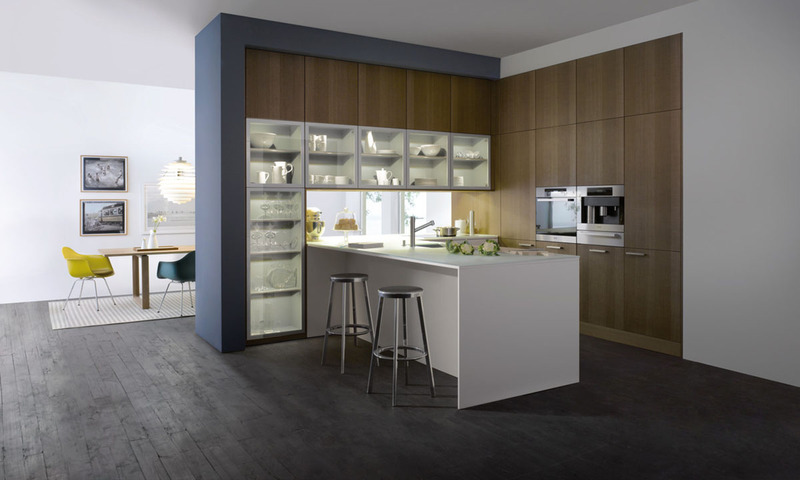 A harmonious trio of materials is created by kitchen fronts of particularly natural appearing copper oak, finished with a saw-cut textured surface. This is further enhanced by the velvet-matt Resopal laminate in magnolia and by glass to the interior and exterior. The kitchen is part of the room architecture. It acts as room-divider and facilitates open plan living. Matt, satin finished glass, suitable for kitchens, is used here as a worktop. It is lacquered on the underside with RAL-“Classic”-color, matching the kitchen fronts. Cupboards extending to ceiling height are integrated into the walls, offering abundant storage space. They house interior pullouts with glass fronts or elegant glass shelves in the narrow tall unit for provisions, easily accessible. Living room or kitchen – the borders are fluid. You must be <a href="https://lussocucine.nyc/wp-login.php?redirect_to=https%3A%2F%2Flussocucine.nyc%2Fkitchens%2Fleicht%2Fmilano-collection%2F">logged in</a> to post a comment.